The beliefs you hold about your math abilities can become self-fulfilling prophecies. Students who struggle with math problems sometimes develop an aversion to math, which becomes a mental block that stymies future learning. If you have a math block, it may help you to know that math is challenging for everyone, even for students who enjoy the subject. What’s more, math professors at Clemson University suggest that virtually everyone in college can conquer math if they put forth the effort. Taking steps to overcome your math block can be useful career preparation. Math competency is needed in nearly all occupations, as indicated in a 2012 Bureau of Labor Statistics report. According to the Texas State Counseling Center, most students who think they’re bad at math suffer from anxiety, not lack of cognitive ability. Symptoms of anxiety include fear, dread and self-doubt. Some students avoid classes and majors that involve math. The Texas State Counseling Center recommends that math-avoidant students seek counseling to help them manage stress and to realize they’re capable of doing well in math. If anxiety is contributing to your math block, a counselor can offer practical techniques for controlling anxiety and gaining self-confidence. Many students believe the myth that natural talent is needed to excel in math. However, Anoka-Ramsey Community College math instructors insist that most students who succeed in math are not gifted mathematicians. Mastering math is like learning to play the piano -- it takes practice and repetition. For instance, Northern Virginia Community College suggests that for every hour of class time, math students need to study three hours outside of class. Another myth is that men are better at math than women; a study conducted at the University of Wisconsin comparing standardized math scores shows no inherent difference in ability. Unfortunately, stereotypes of this kind can keep students from realizing their potential. Acquiring a solid foundation in general math can boost your confidence and make advanced study possible. 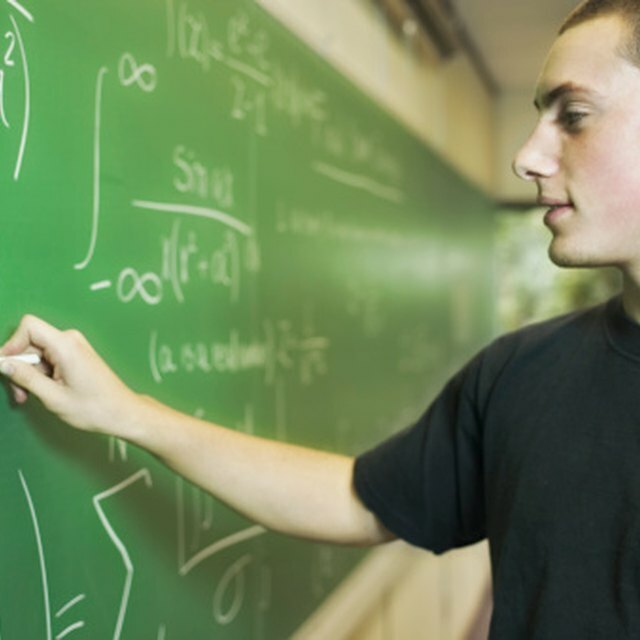 Consult with your academic adviser about what math classes are best suited to your level of preparation. Enroll in developmental math or find a tutor if you don’t feel ready for college coursework. Math builds on concepts previously learned. It may be necessary to repeat a class if you didn't do well, especially if you are majoring in science, technology, engineering or math. Mental blocks may be overcome by being the best student possible. In math class, sit in front and concentrate on what the professor is saying instead of taking copious notes. Raise your hand if you don’t understand the material being presented or visit the professor afterward. Be patient if you need to read your textbook several times to decipher formulas and explanations. If tests make you nervous, practice working under pressure by setting a timer and working problems from your notes or the textbook. During an exam, solve the easiest problems first. Forbes: STEM Fields and the Gender Gap: Where Are the Women? Mary, Dr.. "How to Overcome a Math Block." Sciencing, https://sciencing.com/overcome-math-block-5366.html. 24 April 2017.